Digital technology has been at the heart of most home-based and professional recording studios for about 10 years now, but only recently has it become feasable to carry out every stage of making an album with help from one or more computers. In this two-part article, I’ll be looking at the way computer technology has helped our group Symbiosis to improve the scope of our writing and the sound of our recordings; to master our own CDs; and to develop a distinctive album cover style. The long-term potential of computers in music is enormous. They can offer creative freedom, ways to fine-tune a performance and – eventually – financial savings too! The rewards are great, but the path to achieving this is often a difficult one. Things don’t always work as they should, and computers have a way of dominating the proceedings as soon as they are switched on. The falling cost of hi-tech equipment has brought many exciting tools into the price-range of the average musician, but it can be a time-consuming and frustrating business to learn how to use them. Hopefully, describing our experiences will be helpful to SOS readers who are expanding their own use of computers in the studio environment, both in terms of avoiding headaches and discovering new ideas and techniques. To put the development of our Digital DIY into context, I’d better start with a little group history! When we began Symbiosis, we needed to record concert flute played by John Hackett; acoustic, electric, and STEPP guitars from Richard Bolton; and my own voice, ethnic flutes, and hand percussion. Much of what we do is ‘ambient’ music in the true (Eno) sense of the word, so these natural instruments were blended with atmospheric soundscapes and sampled percussion from synth keyboards. The studio – started in an office at home – underwent a rapid organic growth process as I learned about MIDI. We moved quickly from a borrowed Tascam Porta 2 four-track cassette to a Fostex M80 eight-track linked via a SMPTE timecode stripe and a synchronising unit to an Atari 1040 STFM computer system running C-LAB’s Notator sequencing software. Pieces were mastered onto a Revox A77 from a Seck 18-8-2 desk, and as the synth and digital effects collection grew, we bolted on an Alesis 1622 mixer for extra inputs. After the first two albums (Tears of the Moon and Song of the Peach Tree Spring) we moved to digital mastering on a number of portable DAT recorders before finally settling on a Sony DTC1000ES modified for 44.1 kHz operation by HHB Communications. This DAT recorder also served to back up early experiments on Digidesign’s Soundtools system on a Mac IIcx. ADAT was a major turning point in terms of our studio sound quality, and really stirred things up in many different ways. Here at last were perfect drop-ins, longer recording times, the possibility of making digital clones as backups or for alternative takes and – of course – great sound. Its clean recordings were a real joy, but soon began to highlight weak areas in studio acoustics and monitoring, revealing with perfect fidelity all the hiss, thumps, breathing, rumble and ambient noise that had been masked previously by the relatively high noise-floor and distortions offered by analogue tape. When I produced the series “The Science of Sound” for Radio 4 FM in 1990, I discovered that the BBC’s Research Department at Kingswood Warren was already studying the problems created by the wide inherent dynamic range of digital recordings. There, they were looking at ways of reducing structural noise by improving ventilation systems and door seals, suspending floors, and isolating walls. Back in the Symbiosis studio we had to make do with careful microphone placement, closing the double glazing, disconnecting the phone, and never recording during the rush hour or when Concorde was due to fly over! 2) Our monitor speakers (an old pair of IMF ALS 40’s). My engineering method in the Symbiosis studio has always been to record the instruments as cleanly as possible and to add acoustics from good-sounding digital reverb units like the Microverb II and Quadraverb on monitor headphones, and later in the mix. The ADAT recordings made it clear that there were far too many HF reflections in our 13 feet square room, colouring the sounds of some natural instruments before they even reached the digital effects. I began to develop an obsession for acoustic tiles, which was eventually cured by an order placed with USAFoam in Indianapolis for 16 sheets of 2 feet by 4 feet wedged foam acoustic absorbers. These were chopped up with one of those crucial wedding presents – an electric carving knife – and velcroed round all the available wall space to reduce high frequency ringing and spurious reflections. Studio monitoring was also improved by the foam tiles, but I felt we could go much further, so I embarked on a series of exhaustive listening tests, which ended when I heard a pair of the Professional Monitor Company’s AB1 loudspeakers. After the ADAT, these are definitely the best things we’ve bought for the studio, with their extended but not overbearing transmission line bass response, crisp but smooth top end, realistic voice quality and useful lack of directionality, giving a good stereo image over a wide listening area. They have a neutrality which some might find alarming, but mixes on these speakers seem to sound superb on most other equipment. Room acoustics and speakers dealt with, that just left the loom problems to be sorted out. One of the most exciting developments in music technology in recent months has been the shift towards fully digital mixing desks, lead by the Yamaha 02R, but I realised that we couldn’t possibly justify buying one, so I started to look for cheaper ways to uphold quality in the Symbiosis recording set-up. Going digital as soon as possible in the recording chain – and staying digital – seemed to be the order of the day, and the release of the Alesis QuadraVerb2 reverb provided the perfect answer: and solved our loom problems at the same time. Besides offering really clean reverb and effects, Q2 was designed from the start to link in digitally with the ADAT. Our current recording set-up (see Fig.1) uses short-as-possible audiophile hi-fi cables between the Seck 18-8-2’s Track 1 and 2 outputs and the Q2, and a direct optical link from the Q2 to the ADAT. Once the recorder is switched to DIGITAL IN, the Q2 in bypass mode (Preset 99) acts as a switching matrix to any two of the eight available tracks, and the analogue signal only has to travel down one metre of high quality cable! Recordings made this way sound much sweeter, and clearer at the top end, with the bonus that the Q2’s settings can be edited to provide instant digital EQ on recordings. Used as a high-pass filter, low frequency rumble can be rolled off before it gets to the ADAT, and much more precisely than with the low filters built into our AKG mics. Q2 can also store a range of ‘instant EQs’ for any instrument regularly used by the group. Major equalisation changes are still left for the final mix, but the results going to tape are much more controlled. (Its a shame that the Q2 doesn’t have any compression or peak limiting functions to prevent accidental clipping, but you can’t have everything, I suppose.) Results through the mixing desk were further enhanced by throwing out our old 16-way loom altogether, and making up short-run good quality cables to get signals back from the ADAT’s outputs to the desk. Once this is done, you can bounce signals from track to track with no loss, one or two at a time. You can also choose any Q2 patch to add EQ, effects, or delay during the bounce. It’s important to know that the Q2’s meters only display anything sourced from channels 1 and 2 when used this way, so it’s best to look at the ADAT’s input metering to check things are working properly. Anyone owning the newer ADAT XT won’t be so interested in these features, but for the 1000’s of original ADAT users, the Q2 really is a sensible upgrade, especially as it’s A to D converters are better than the first generation ADAT’s (being 18 bit and 128x oversampling). Once the ADAT was transplanted in as the new heart of our studio, other useful directions emerged. We added an Alesis AI-1 digital interface and sample rate converter to allow sound to be transferred digitally from any source, or moved between the eight-track and Sound Designer II software via an AudioMedia II card on the Mac. This instantly gave us the freedom to improvise onto the ADAT, then edit two adjacent tracks in Sound Designer, pass them back digitally and use that as the starting point for new pieces. The best example of this is John Hackett’s tune ‘The Golden Temple’ on our CD Autumn Days, which was assembled from six takes of bamboo flute and darabukke drum, then passed back to the ADAT to have cymbals, frame drums and jingles added before mixdown. Nowadays, neither John nor I can remember where the edits were! Used this way, Digidesign’s software often reverts to its original function – that of sample editor – giving us the chance to alter pitch, edit, blend and even turn sound round without any quality loss. Interestingly, it has proved possible to use the AI-1’s sample rate conversion facility over a very wide range, and signals fed out of the AudioMedia II at a playback rate as low as 1kHz (a drop of over 5 octaves!) are still converted to 48kHz on the ADAT without any problems. AudioMedia’s coaxial S/PDIF outputs have proved useful for interfacing directly with equipment such as DAT recorders and a Roland S760 sampler with the OP-760-1 output board fitted, and also with another handy building block in the Symbiosis digital studio: a Cambridge Audio DACMagic 1. This is actually a hi-fi component offering a very good quality digital to analogue converter at a reasonable price (it’s available from the Richer Sounds chain of shops for under £200) with three switchable co-axial inputs, one co-axial digital output and line outputs from the D to As on both phonos and canon sockets. We use DACMagic as digital signal router and listening point, saving lots of re-plugging and augmenting by two the existing four separate outputs from the excellent S760. One of the two extra digital outputs from the 760’s I/O board is permanently plugged to a DACMagic input, and the D to A outputs appear on two channels of the mixing desk (see Fig.3). The final elements in our digital studio are a JL Cooper SyncMaster (for synchronising the Mac to SMPTE timecode), a JL Cooper dataMASTER (which generates SMPTE from the ADAT without wasting a track to record it) and a Sony DTC-A8 DAT machine, replacing our DTC1000ES. All our music is now mastered onto the A8 using its Super Bit Mapping option, which seems to impart a richer, ‘firmer’ quality to the work, and provides a much better sense of space at low listening levels. As we bought one of the first A8s in the country, even HHB didn’t know that the machine suffered from the dreaded SCMS (Serial Copy Management System), but copies can still be made via the digital inputs of AudioMedia or the AI-1, both of which strip off the copy-protection flag set in S/PDIF signals! I should also mention that I’ve also upgraded the Mac IIcx to a PowerPC 8100 / 80 with a 1 gigabyte AV hard drive to cope with digital image handling for album cover design (more about this next month), and we have recently obtained OSC’s Deck II and E-Magic’s Logic Audio in the hope of further integrating MIDI recording with hard disc editing and mixing. One of the major bonuses of combining real instruments and MIDI gear in our original analogue studio was that most of the sound sources went through the desk ‘live’ at mixdown. So it was relatively easy to master tracks to a very high standard. Happily this has not escaped reviewers of our music, who have often commented on the technical merits of our albums as well as the musical ones! Nowadays, wearing my ill-fitting, but still hyper-critical ‘BBC engineer’ hat, I can acknowledge that, in truth, the ‘natural’ instruments recorded to analogue tape were only just OK, and were in effect ‘carried’ by the quality of the MIDI-sourced sounds around them. Now we are working with the clarity of digital recordings on the ADAT and better reverbs like the Q2, the reverse is happening! Some of the old synthesisers are being shown up by their quantising noise, or lack of high frequency sparkle. (I’m thinking now of our much-loved D550 and TX7 modules, and even the Korg M1R.) We’ve had the chance to try the Alesis QuadraSynth Plus Piano, the Yamaha VL7 and the Roland JV1080, all of which really do ‘shine’ in a mix, but I can’t help wishing that more instrument manufacturers had followed Alesis’s lead and begun to put digital outputs on their products sooner. After all, somewhere inside those little black boxes the sounds are there in digital form, and in a few years – when we’re all using digital consoles – I bet we’ll all be sorry! So far I’ve said a lot about the technical side of developing and using a digitally based studio. But what about the creative aspects of using new technology? Well, to me it’s a curious mixture of good and evil. Recording studios have always been places where things can go horribly wrong, wasting precious time and money, and the more complex we make them – with MIDI and digital connections – the more frustrating the problems can become. We’re trying to link pieces of equipment from so many different manufacturers to make them do something new and wonderful with sound, only to discover that often the system doesn’t work as it should, and no-one can tell us why! But despite the hassles, I certainly couldn’t live without the enormous palette of sounds; the quality of ADAT recordings; the creative possibilities of hard disk editing and the relative ease of use of many of the studio’s components. Above all, the Symbiosis studio is always there to catch the mood for making music, day or night, instead of having to hire a studio, book the musicians and an engineer, lug the gear, and then put in a world-class performance when someone else says so. And the results that come out of it are ready to turn straight into an album! I suppose a major snag with today’s technology is that it develops so fast that there is barely enough time to assimilate the possibilities offered – and the techniques required – by one bit of gear before we have to move on to the next. (Music technology must be the most obvious manifestation of the devil in consumer society since the car, but I love it anyway!) The only answer seems to be to alternate technical ‘learning and editing’ sessions with creative ‘writing and recording’ ones, so that the frustrations of the former don’t taint the exciting potential of the latter! Above all, we need to test equipment well before we buy it, and make sure that we can work easily and intuitively with it. – Don’t just use your synthesiser’s presets! Collect the largest palette of sounds possible, and create or edit your own voices for your instruments. – Don’t restrict yourself to a five octave keyboard – get a larger one, transpose, or tie two together through a sequencer. – Use keyboards and drum pads with a sensitive velocity response, and if necessary use your sequencer to edit the response to suit you! – Try adding your own effects to MIDI instruments, even if the sounds have them built in. – Make notes of reverb and effects settings for live players, so you can re-create the space they heard whilst recording when you do the final mix, to make full sense of their performance. – Edit digital effects specially to suit your work, and individual pieces. – Be aware that digital effects often sound very different in mono, so check their mono/stereo compatibility. – Remember that most effects units can be controlled by MIDI during mixdown! – Take care when using sampled sounds, especially in loops or as the lead line. – Remember that many synthesisers have a greater variety of tone and modulation than samplers, and session players – especially percussionists – can add even more ‘human touch’. – Make full use of MIDI Controllers – Mod Wheels, Aftertouch, MIDI Volume. – A well set up MIDI-based studio can have few variables, so try to look for ‘happy accidents’ while you work. – Watch for equipment noise build-up when making multi-track mic recordings near a Hard Disk or computer-based system. – Check your mixes on headphones if you think equipment noise in the mixing area might be masking low-level problems. – Always back up your computer work. – Try creating a MIDI backing mix on two tracks, then record instruments elsewhere, using ‘real’ acoustics. – With prices falling all the time, choose carefully when you buy, and only spend money on the things you absolutely need. – Consider hiring equipment, co-owning or exchange hire with friends. – Register your software and hardware for up-to-date support and upgrades. – Get as much personal tuition in the technology as possible from friends and manufacturers. Richard Bolton – Acoustic & electric Guitars, STEPP synthesiser guitar and cello. 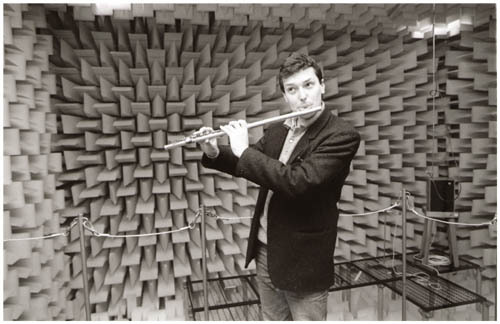 John Hackett – Flutes, and keyboards. 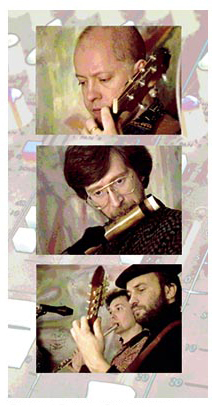 Clive Williamson – Keyboards, wind synthesiser, autoharp, ethnic flutes, hand percussion, voices and whistling.